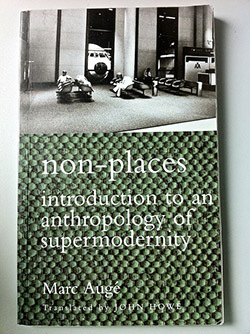 ♦ Non-places: An Introduction to an Anthropology of Supermodernity, Marc Augé, Verso, 1995. ♦ ‘A Provisional Theory of Non-Sites and Entropy‘ and ‘The New Monuments’ in Robert Smithson: The Collected Writings, Robert Smithson, ed. Jack Flam, University of California Press, 1996. ♦ ‘The End of Temporality’, Frederic Jameson in Critical Enquiry, Vol. 29, No. 4, 2003. ♦ ‘Image, Medium, Body: A New Approach to Iconology’, Hans Belting in Critical Enquiry, Vol. 31, No: 2, 2005. ♦ ‘Against Space: Place, Movement, Knowledge’, Tim Ingold in Boundless Worlds: An Anthropological Approach to Movement, ed. Peter Wynn Kirby, Berghahn Books, 2011. James Bell is an artist based in Edinburgh. After graduating from the MFA at Duncan of Jordanstone College of Art & Design, Dundee, in 2011, James served on the committee of Generator until 2013. Previous exhibitions include 24 Spaces, Malmö Konsthall, Malmö, 2013 and Inertia, The Lombard Method, Birmingham and Generator Projects, Dundee, 2011.